I’ve had to push my body to limits it shouldn’t have to reach. One day I was fighting fatigue while pitching multiple games daily, and the next struggling to just catch my breath and crawl out of bed. 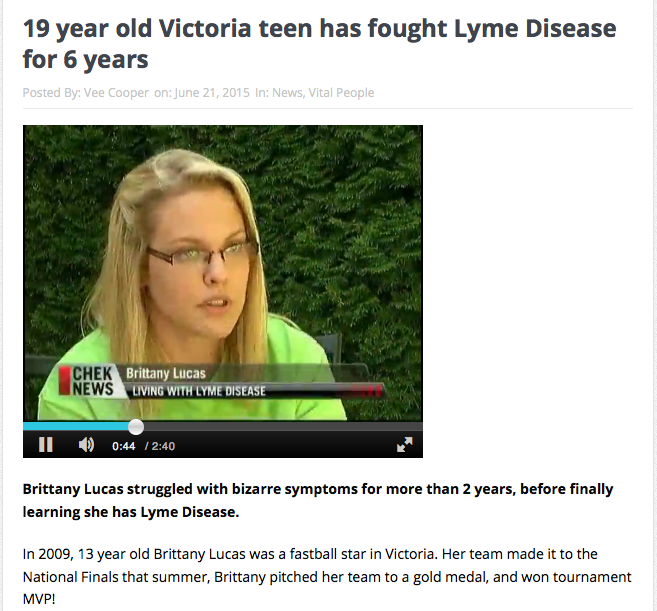 I’m 19, and Lyme Disease stole my dream, and health. Lack of knowledge by Canadian doctors forced my family to seek on-going treatment in Los Angeles, at tremendous personal expense. Although my heath is improving, I continue to struggle with daily life, and hockey helps me through it! Two gifted athletic friends of mine, Daniel Corso and Tanner Cookson, are currently riding their bikes across Canada to raise awareness and funds for Lyme Disease. Their project inspired me to share my story, in the hopes of encouraging you to donate generously and raise awareness in my name – Brittany Lucas. Please assist me in scoring my goal of helping ‘Ride For Lyme’ spread hope across the country by visiting their website, http://www.rideforlyme.ca. You’ve been my inspiration, so I hope this inspires you to bring Lyme into the Lymelight.